Japanese Yen: Intervention is Imminent? 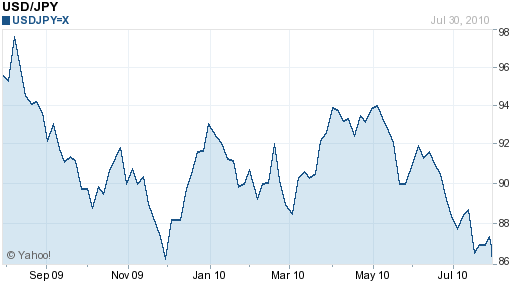 I last mused about the possibility of Japanese Yen intervention in June (Japanese Yen: 90 or 95? ): “It seems that anything between 90 and 95 is acceptable, while a drop below 90 is cause for intervention.” Since then, the Japanese Yen has fallen below 86 Yen per Dollar (the USD/JPY pair is now down 7% on the year), and analysts are beginning to wonder aloud about when the Bank of Japan (BOJ) will step in. The BOJ last intervened in 2004. Given both the price tag ($250 Billion) and the fact that in hindsight its efforts were futile, it appears somewhat determined to avoid that route if possible. In addition, any intervention would have to be implemented unilaterally, since the goal of a cheaper Yen is not shared by any other Central Banks. As if that were not enough, the cause of intervention would be further contradicted by improving reports on the economy and by higher-than-forecast earnings by Japanese exporters, both in spite of the strong Yen. Analysts remain mixed about the likelihood/desirability of intervention. Most admit that as with the last time around, it would be an exercise in futilty, since “the yen’s gain isn’t being driven by speculation,” and investors would probably be willing to buy any Yen that the Central Bank sells. Instead, the BOJ will probably continue to pursue a policy of vocal intervention, which can be equally effective and much less expensive. Government officials – at least the ones with any jurisdiction in currency issues – have remained reticent on the topic of intervention. That’s not to say that they couldn’t be swayed by pressure from the Minister of Trade and others, which have repeatedly voiced their irritation over the Yen’s strength. Ultimately, trying to predict whether intervention will take place is probably just as futile as any intervention, itself. Still, 85 is a level of obvious psychological importance, as is 84.83, the 14-year high set last November. If the Yen drifts below that, one would expect the Bank of Japan to at least make a token effort to depend the Yen. Even if the economy can withstand a weaker Yen, it will nonetheless benefit from a stronger Yen, and regardless of what the BOJ says, that is what it would like to see. To my mind Yen is likely to rise up by the end of the summer. And USD seems to lose all positions against EUR and Yen at the beginning of October, because both Europe and Japan are trying to suppress the further rise of the American currency. actually the USD/JAP is my favorite par to trade. I can be delightfully volatile. I don’t know what else the BOJ can do.. what if USD/JPY falls below 80? Then what? Do we drop further? or does BOJ have soething up their sleeve?